Juronomo is a DJ/Producer based in China by way of Australia. He’s contributed a lot of original songs on Splice and you can sign up to download the full sessions for his projects to collaborate with him and create your own versions. One of the techniques he uses in his music is sampling chords to create new progressions and variation. Read on to find out how Juronomo explains this great technique in his own words and explore these projects so you can learn to sample chords for use in your own music. Insert your VST of choice and choose a suitable synth patch. Make a midi clip and draw in the notes for your chord (Don’t forget to reorder your notes and choose a voicing that you like). This step will largely depend on your track’s instrumentation. Just remember that the sky’s the limit here. You could even use diminished or augmented chords. Once you’ve decided upon the type of chord you’re after, right click on the channel header and select ‘freeze, and then ‘flatten’. You’ll be left with an audio clip. 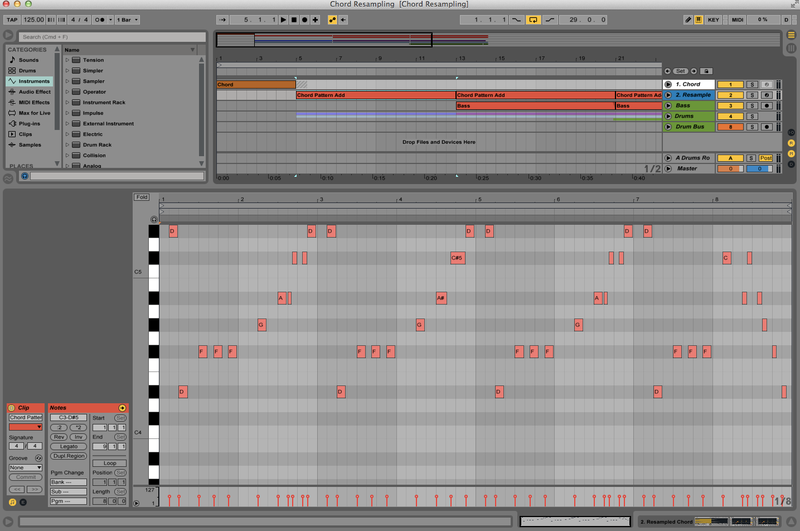 Drop the rendered chord into a sampler, select your root note as the root key, and go ham! The way in which this technique is used will largely depend upon your track’s content. If you’re working with just a bass line, try using the same midi clip to re-trigger your sampled chord. This can have truly inspiring results and gives you a contrasting motif to use as a basis for your verses. If your track already contains a chord progression, or is tonal in nature, try using the sampled chord as part of a transition. Ascending midi notes bring a certain intensity and can be used as an integral part of your builds. This trick is used a lot in a number of different genres. You could argue that the same result can be achieved via your synth oscillators or simply by playing the same shape up or down your keyboard. However, there’s a certain aesthetic that can only be achieved through sampling. So, next time you’re stuck for inspiration, why not give it a go?